I have been just so busy. Between working, excessive travelling and a rapidly growing Zoya, well, there has not been a moment free. 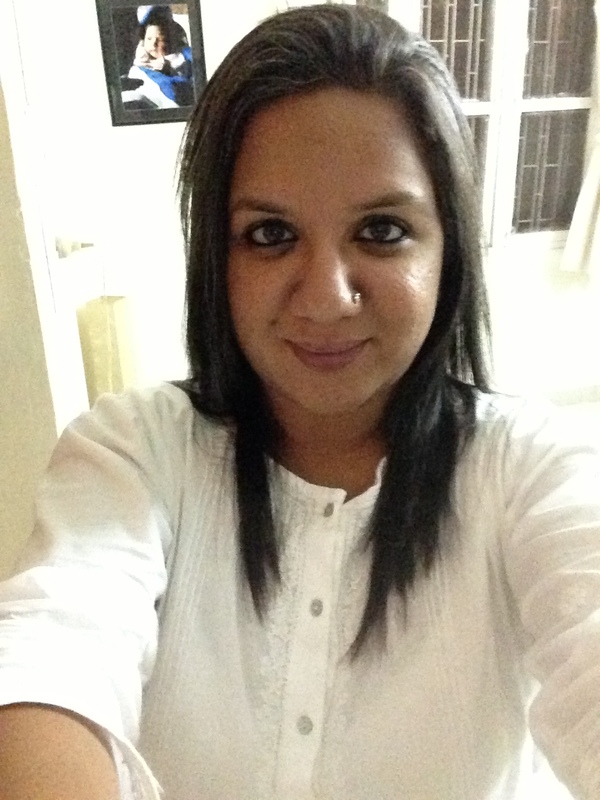 I did manage to get half a day off in a different city, and so I went ahead and got my hair straightened. I am happy. No knots, no combing, no anything that wavy hair requires. It will be a nightmare when the chemical begins to wear off. 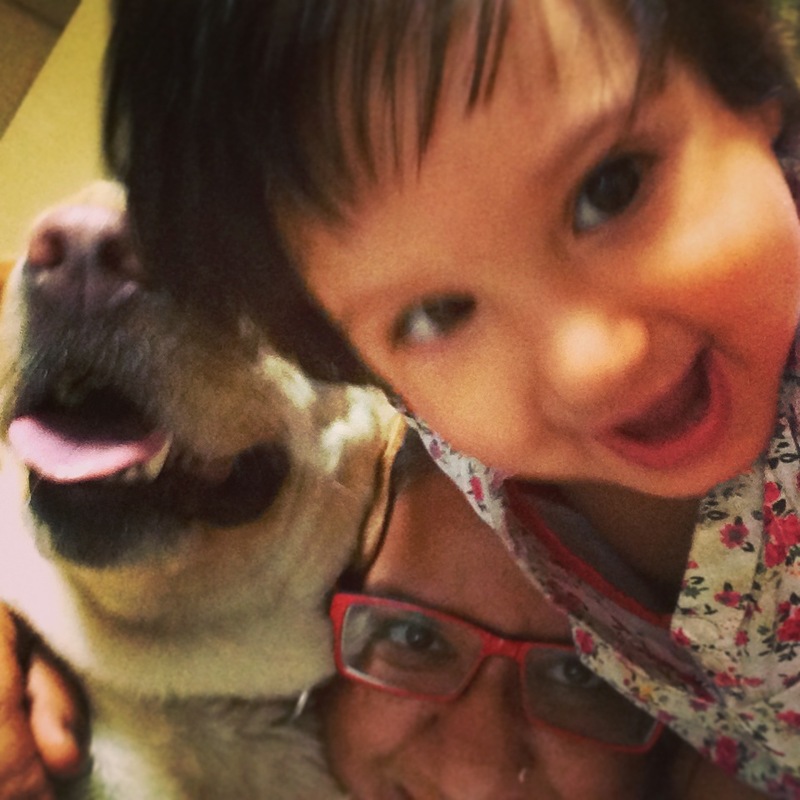 Till then, I am going to keep smiling. 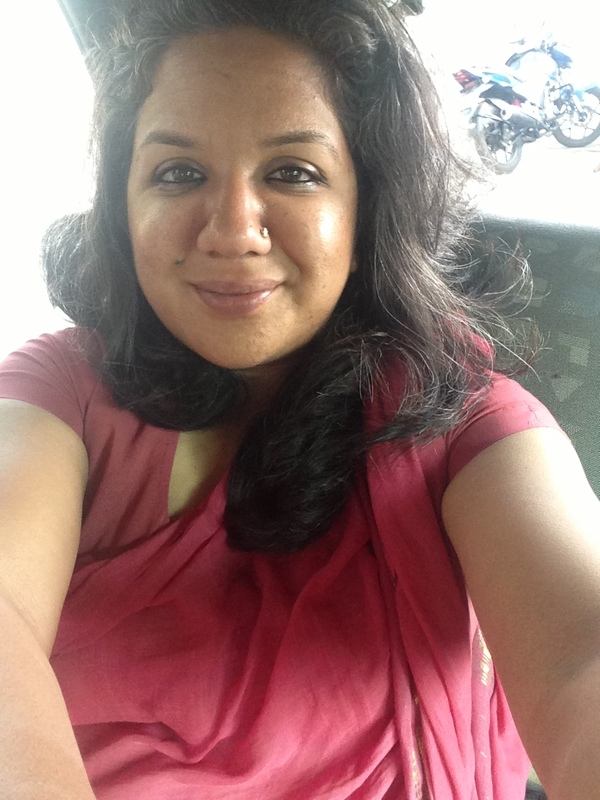 So, I was travelling through Coimbatore and thereabouts. 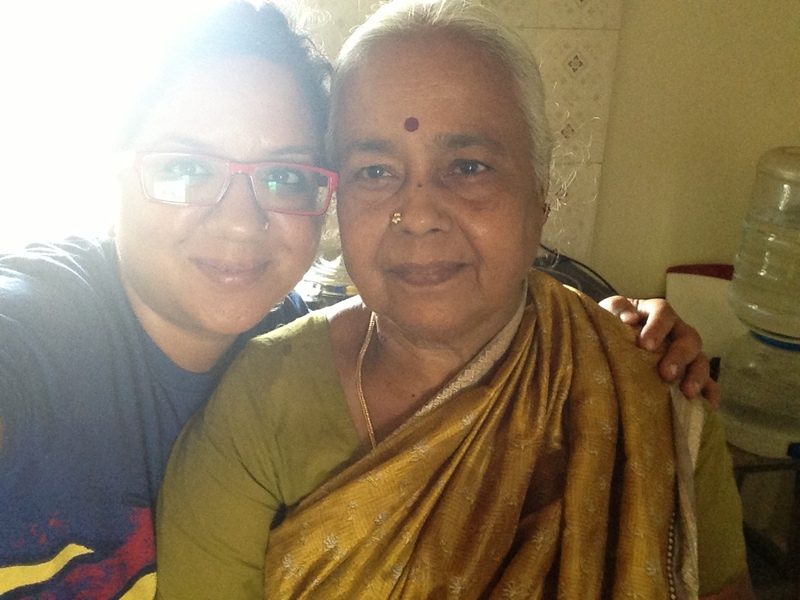 And I met an old woman – Amma (Mother). What a fabulous cook! 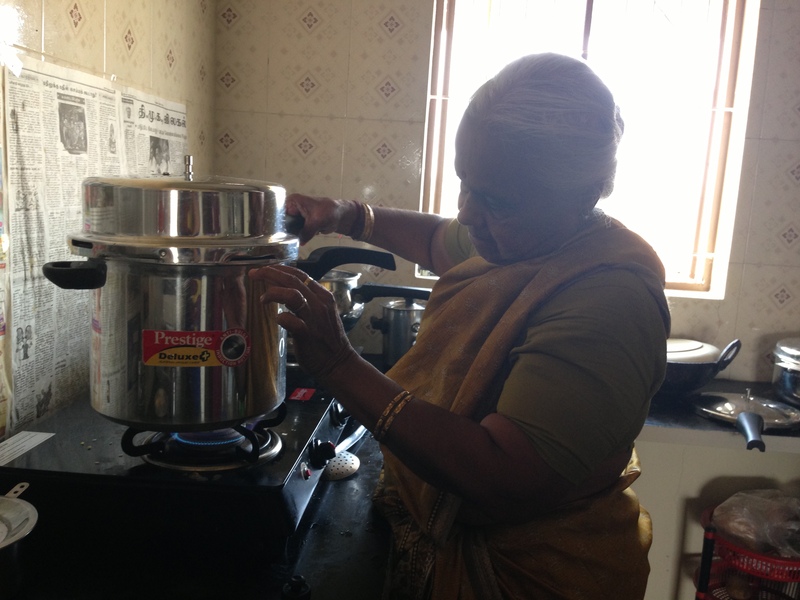 When her daughter was getting ready for the shoot, Amma was busy in the kitchen making breakfast for all of us. 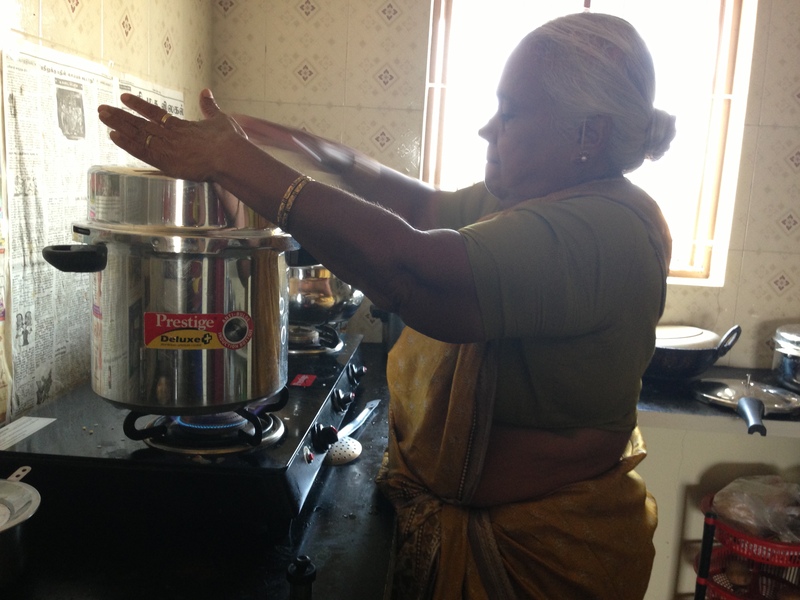 Pongal is what Amma made – a rice and dal concoction that usually is a sleep-inducing dish thanks to all the ghee and dry fruits that go in. 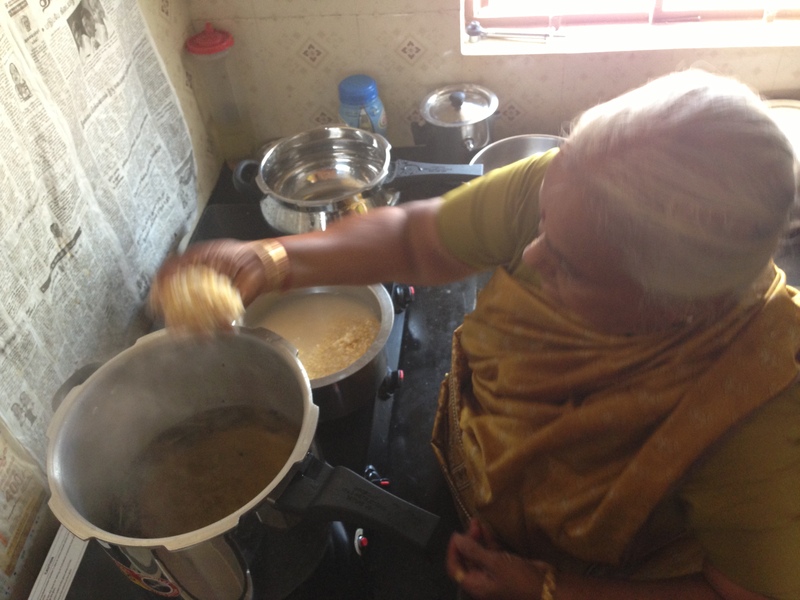 However, Amma’s pongal was perfect – little ghee, no dry fruits, no sleep. 1. She was making breakfast for 12 hungry people. 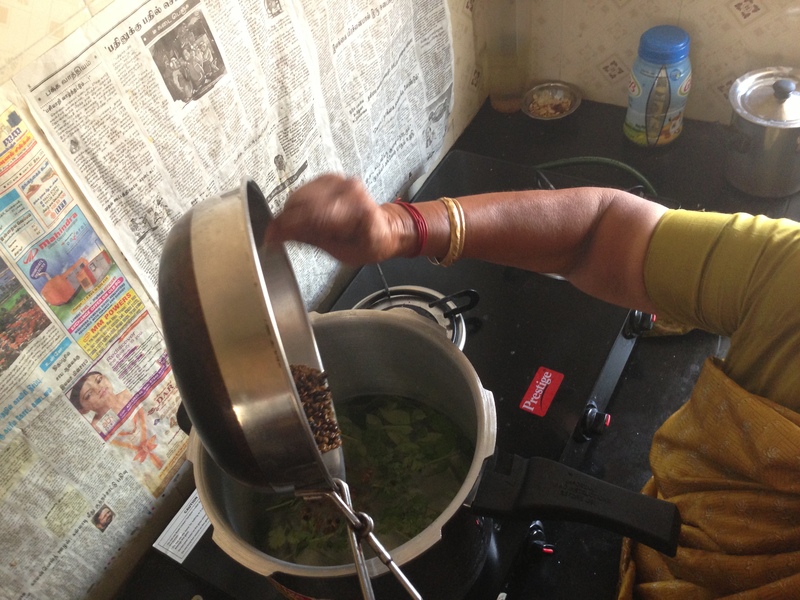 So hers was 7 glasses of rice and 3 glasses of yellow moong dal, soaked early in the morning. 2. 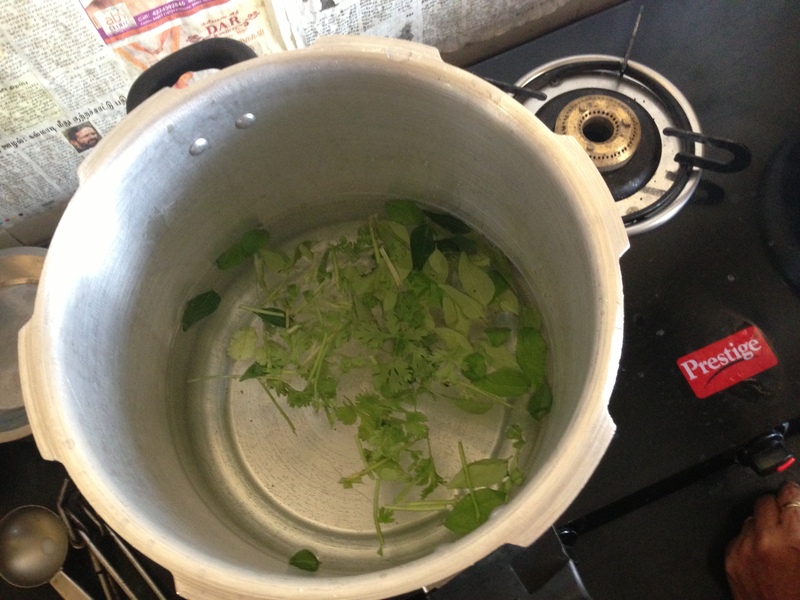 In a pressure cooker, add 2.5 times the quantity of water to that of the rice and dal, curry and coriander leaves. This, I’d like to point out, is a actually very good for the kidneys as it flushes out toxins!! 3. 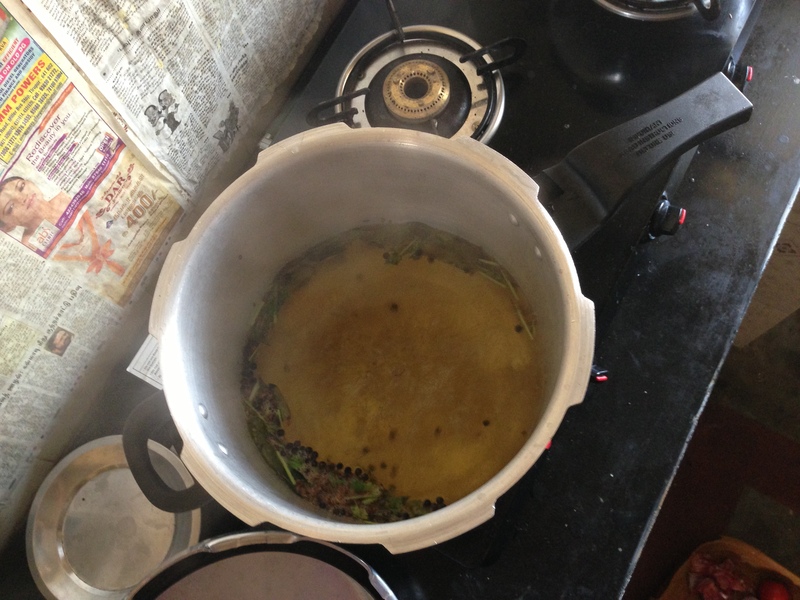 While the leaves boil, dry roast 1 tablespoon each of cumin seeds and peppercorns. 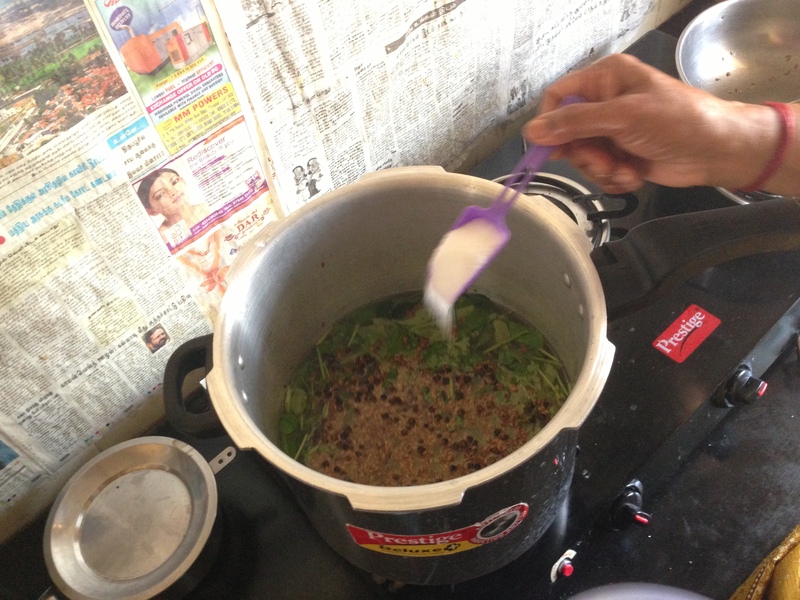 When the aroma fills the kitchen, add a dollop of ghee and let the seeds sputter for about half a minute. Pour this into the boiling water! 4. Add salt and turmeric. 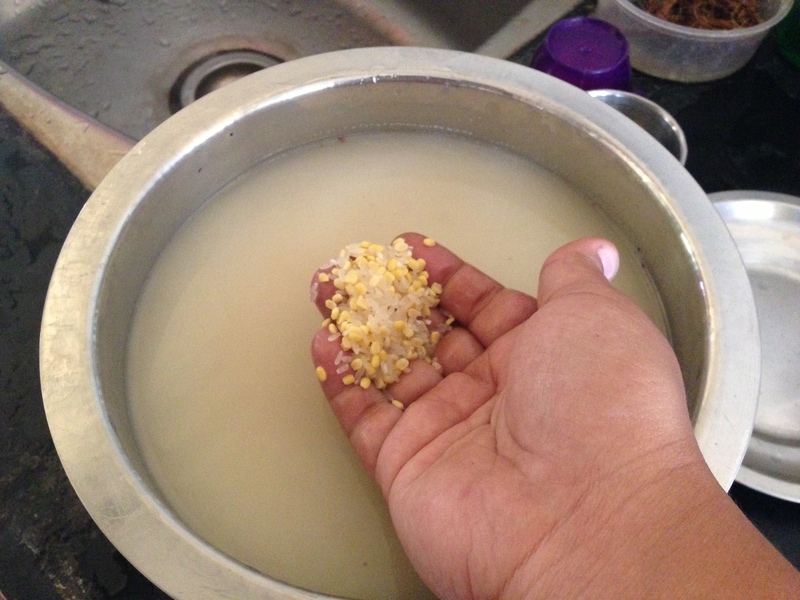 Let it boil for a minute or two, while you clean the rice and dal mix. 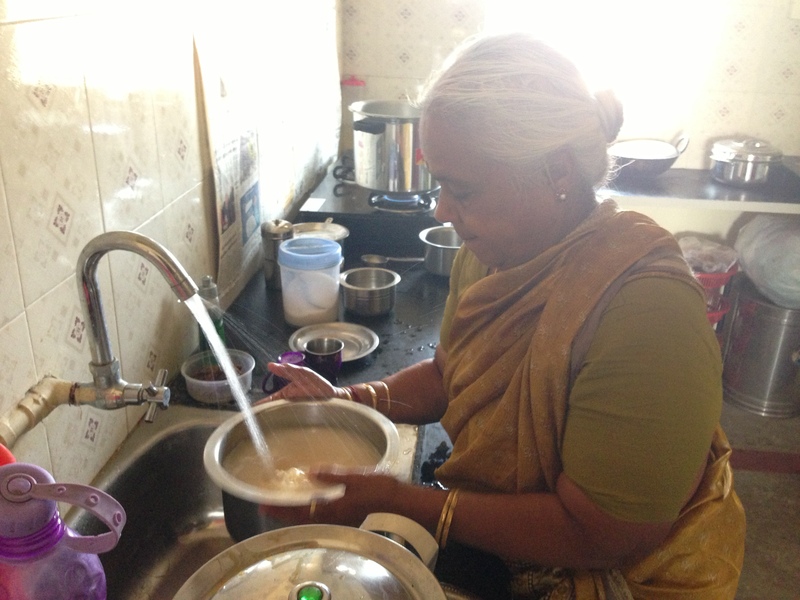 Amma cleaned this dal rice mix like she were washing clothes! 6. 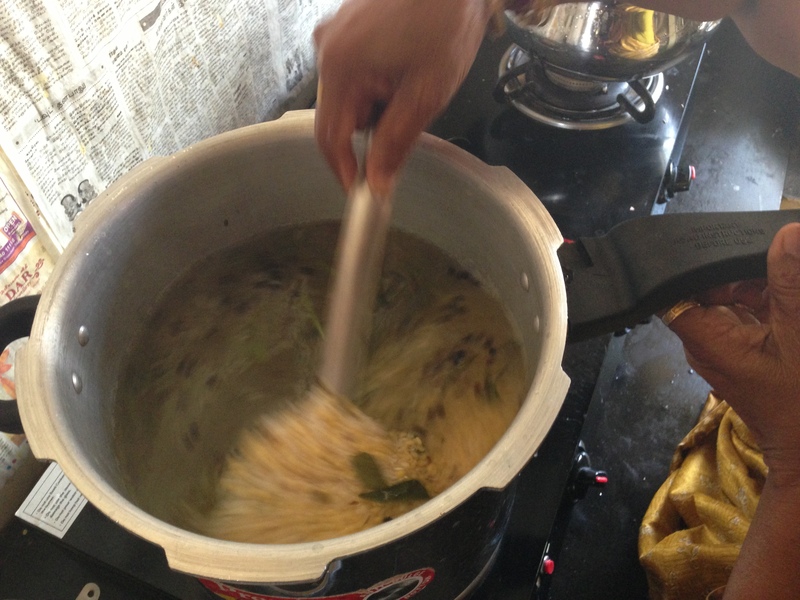 Add the rice and dal mix to the boiling water and stir it well. You may add some more seasoning to it if required. 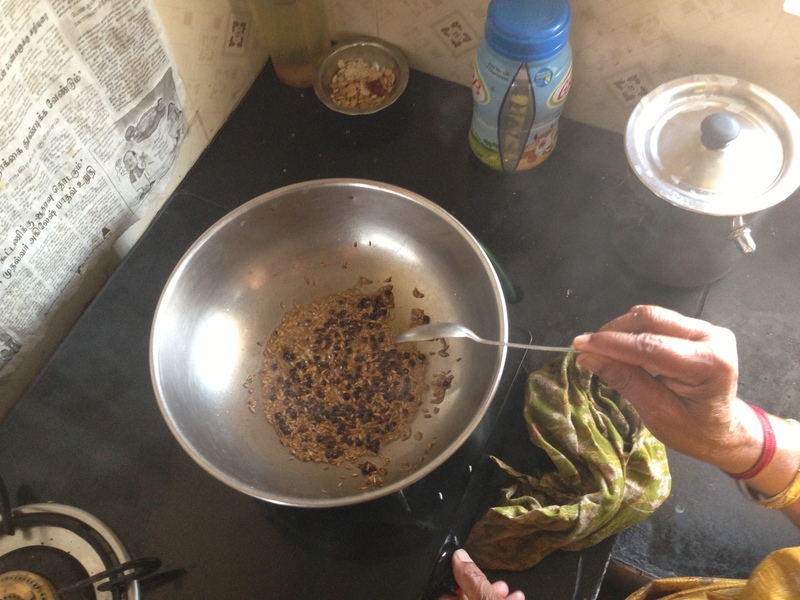 You can also add some fried dry fruits like cashew nuts or peanuts at this stage. 7. 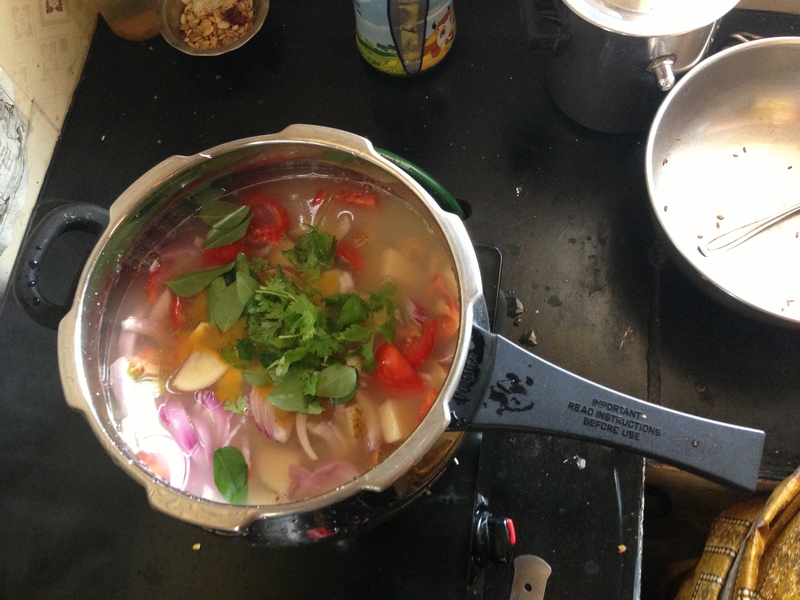 Close the lid of the pressure cooker, 1 whistle and about 15 minutes on low flame. She actually beat it very angrily and I know she was abusing it in Tamil!! 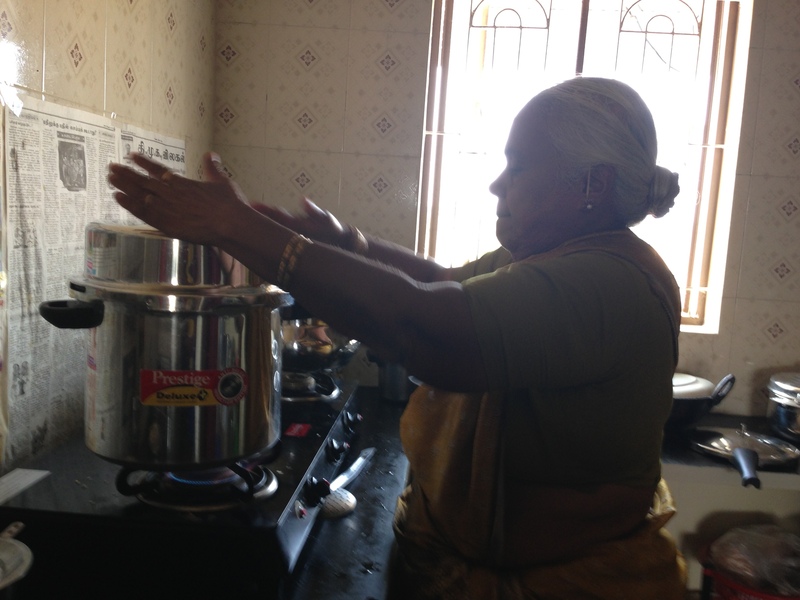 And then, Amma made sambar, making me really wonder what the hell have I been doing with the sambar I make! Now this is really the BEST sambar ever! 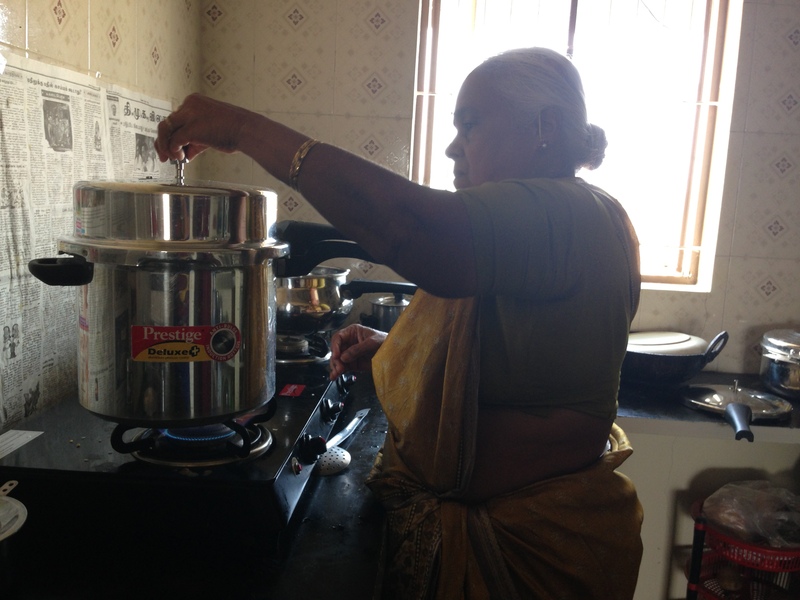 Toor dal, water, tomatoes and onions sliced, potatoes, drumstick, curry and coriander leaves, salt, turmeric and her homemade sambar powder – dunk everything into a cooker, 1 whistle and 10 to 15 minutes on a flow flame. 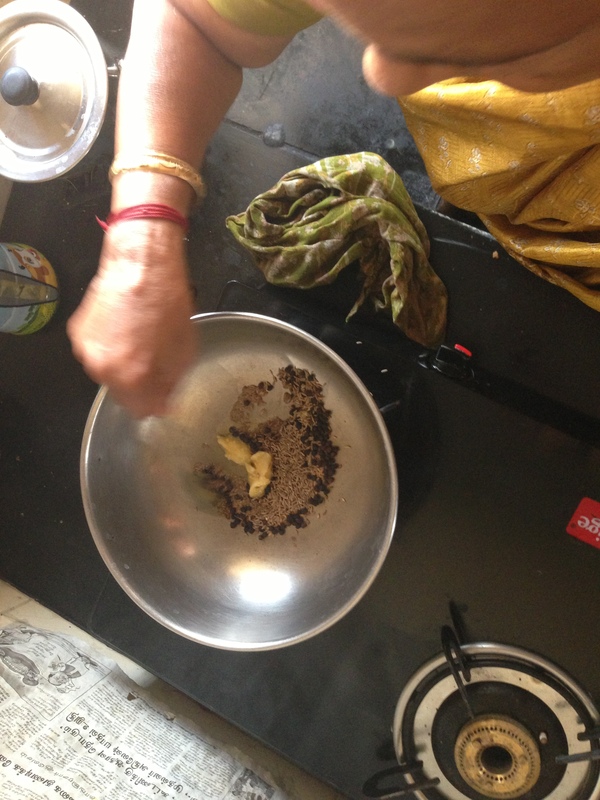 Tempered with mustard seeds in ghee. Done. I picked up the Navdharsham Sambar Powder while I was in Bangalore.